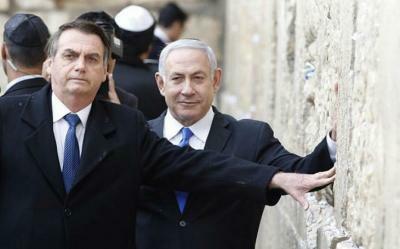 The Yad Vashem Holocaust Remembrance Center and Israel’s president both rebuffed Brazilian president Jair Bolsonaro for comments on the Holocaust on Saturday. “We can forgive, but we cannot forget. That quote is mine. Those that forget their past are sentenced not to have a future,” Bolsonaro had said on Friday, talking about the Holocaust, according to AP. The Yad Vashem memorial issued an official statement on Saturday, voicing their disagreement. “It is not in anyone’s position to determine who and if Holocaust crimes can be forgiven,” the statement said. Israeli President Reuven Rivlin also took to Twitter after Shabbat ended to take the Brazilian president to task. “None can order forgiveness on behalf of the Jewish people, and no interest will buy it,” Israeli President Rivlin said on his Hebrew-language twitter account.